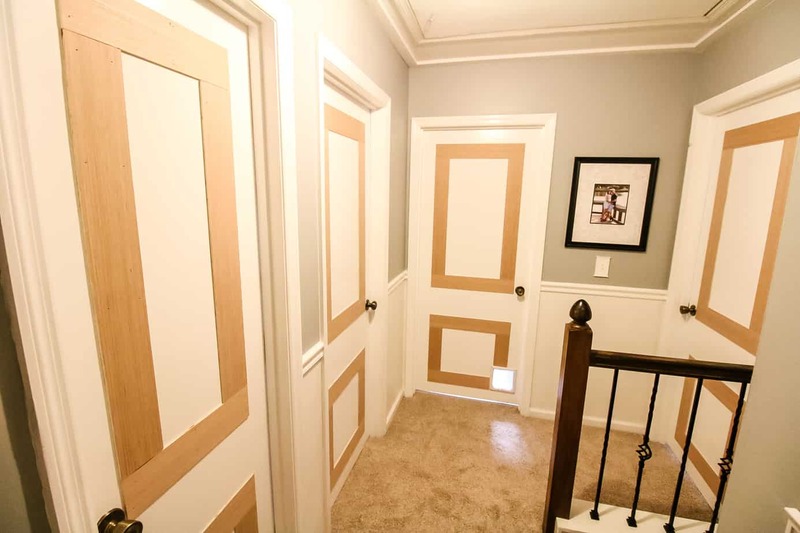 Our 90’s home was graced with ugly flat panel interior doors that are nothing nice to look at. Today, we’re talking to you about updating interior doors with molding. Adding a little bit of detail to flat panel doors transforms them into something you can be proud of. The first thing we did was go around and measure each door. While they are all the same height, they were almost all different widths. We opted for a pattern of a tall rectangle and a small square for each door. 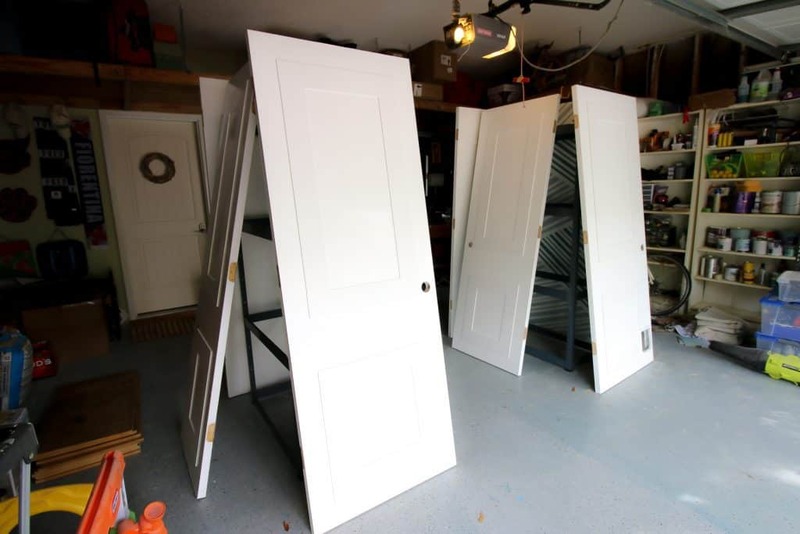 For consistency (since none of the doors were the same size, the best thing to do was to say that the design would be set four inches in from the edges of each door. The molding option we used was 1/4″ plywood. We decided to use four inch wide strips of plywood to match the four inch space around the rectangles. You could use actual molding, but plywood is much more budget friendly. Each upper rectangle was 41 1/4″ tall and each square at the bottom was 22″ tall. The widths varied based on the door. 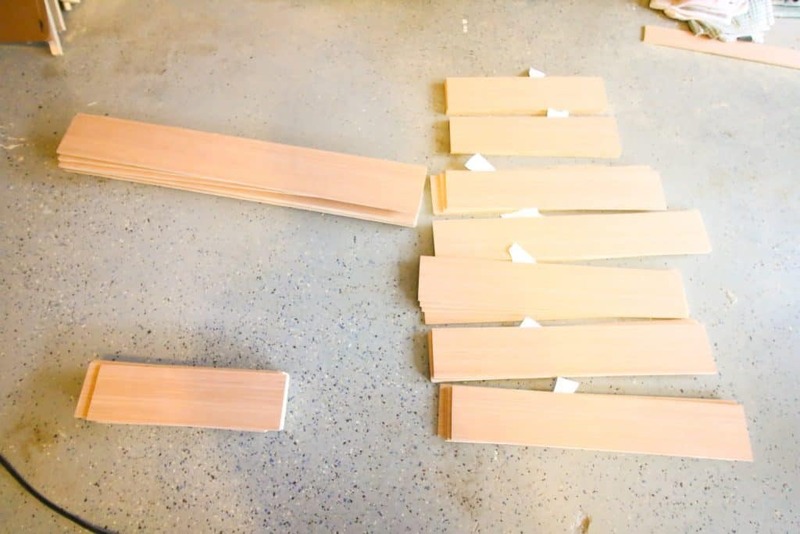 We ripped down the plywood into 4″ wide strips, then cut all the strips we needed for each door. We then used a combination of different squaring tools to make sure that the four inch gap was equal around the doors. 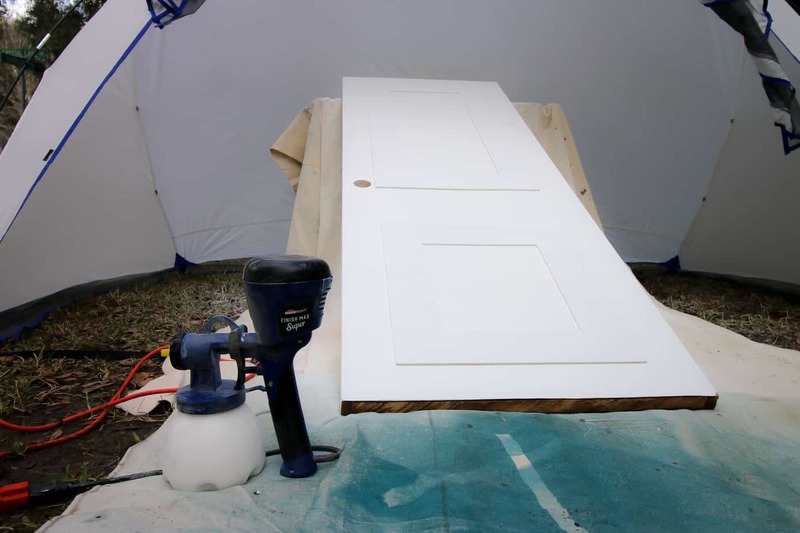 Then we used a brad nailer with 1″ nails to attach the strips to the door. When everything was up, we caulked the holes and seams, then sanded everything smooth. Finally came the real transformation. This wouldn’t be possible without our friends at HomeRight. 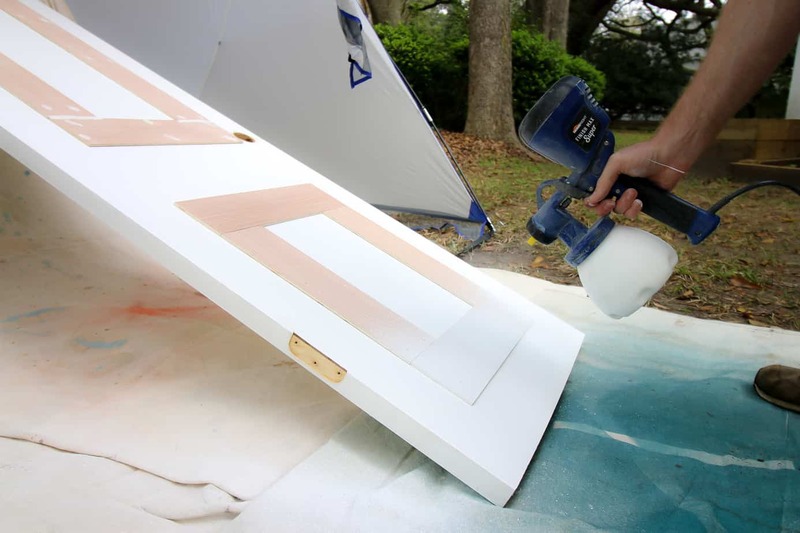 We used their Super Finish Max Sprayer to paint all our doors the same color. Using HomeRight’s large spray shelter, we were able to keep the wind and dirt away from the doors while spraying them. 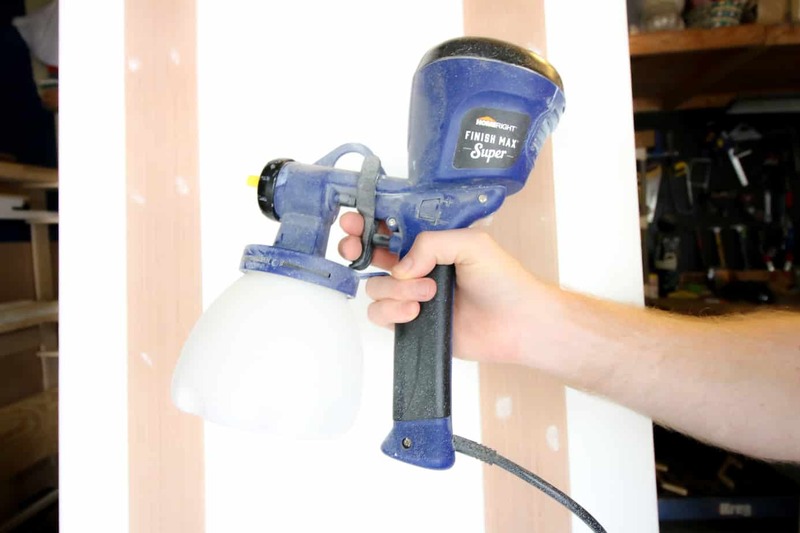 HomeRight’s Super Finish Max Sprayer made this project so easy. The spray stream from the Finish Max is consistent, smooth and really covers well. We were able to spray all the doors in our house in about two hours, allowing for slight drying breaks. We did each door one at at time and then propped them standing up in the garage. 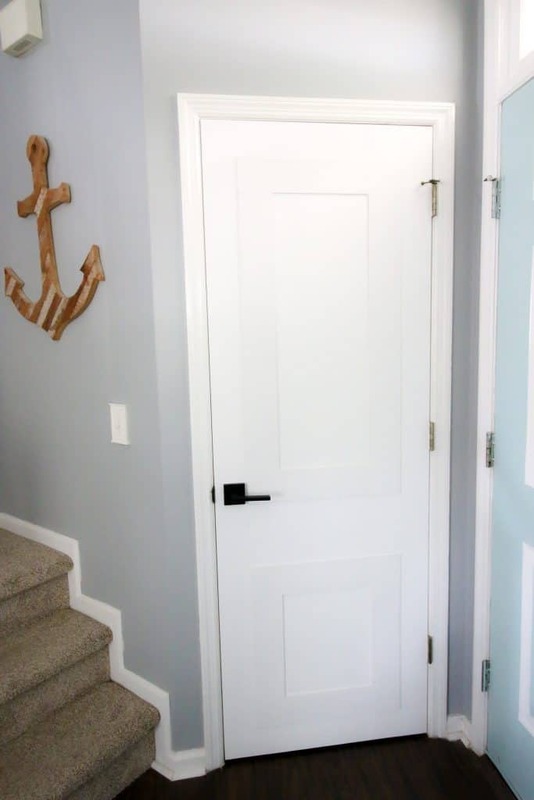 This fairly simple updating interior doors project took our boring flat panel doors from drab to fab. The 1/4″ plywood looks seamless on the old doors and looks like it’s always been there. 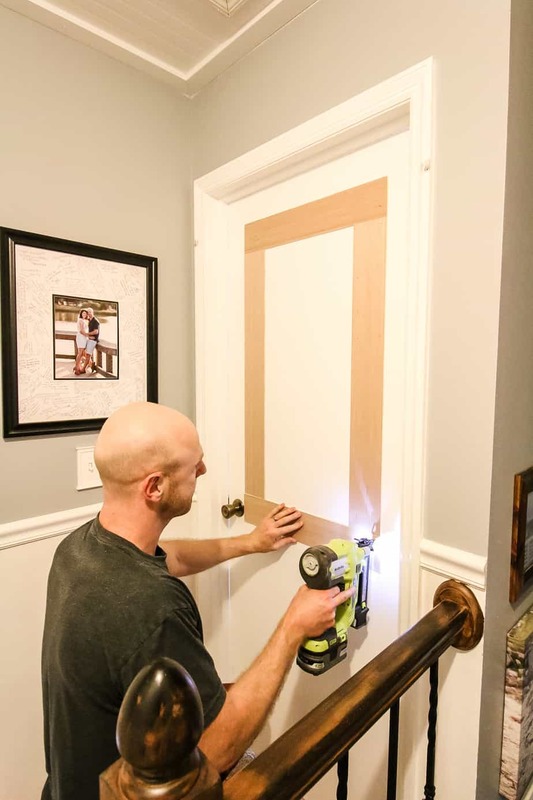 We love how upgraded the doors look now thanks to some ingenuity and HomeRight! It might be a little harder to see online, but the difference in person is truly outstanding. Print off all the steps needed with our how-to guide below! 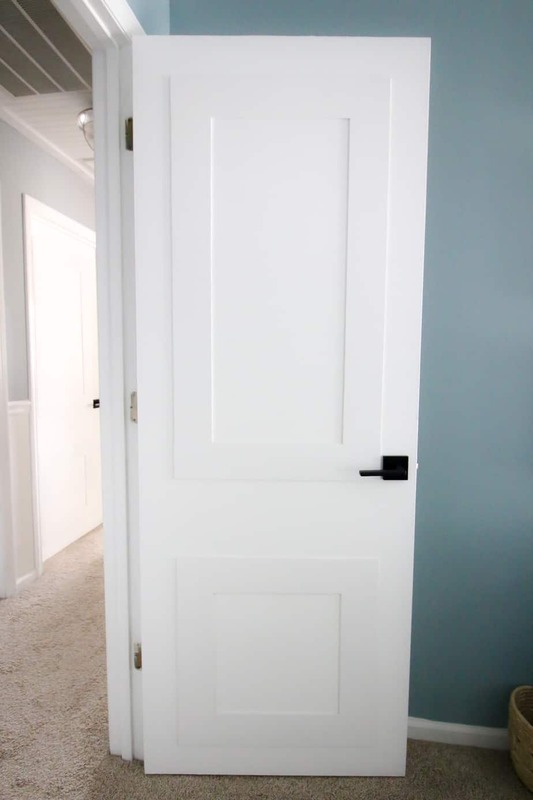 Flat panel interior doors can be super boring and builder grade. Here is how to upgrade them in an easy and budget friendly way. 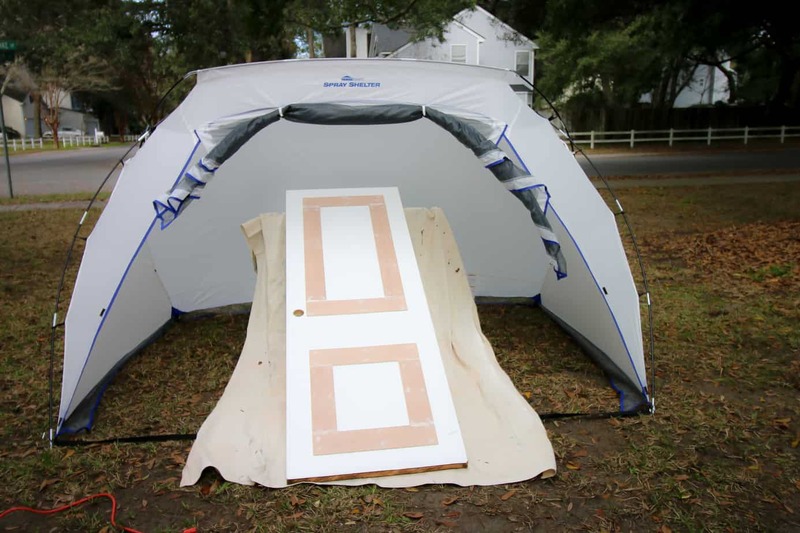 Determine lengths of plywood needed. Measure twice! See notes below for more. Cut plywood into 4" wide strips. Cut plywood strips to pre-determined lengths. Remove existing knobs from doors. 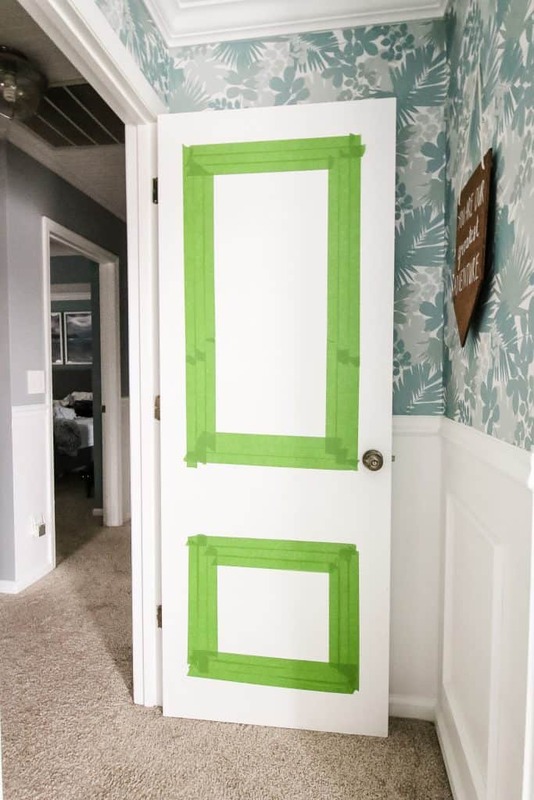 Use speed square + level and a pencil to mark lines where your molding will go on each door. 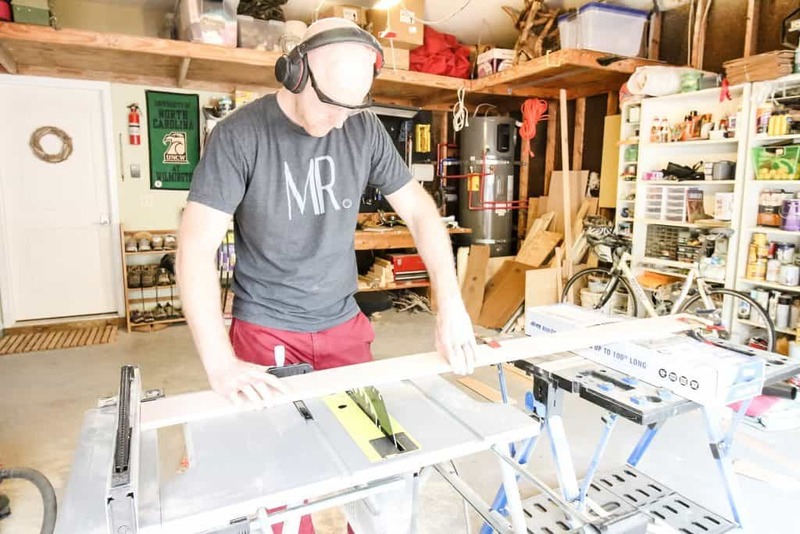 Use brad nailer to attach plywood along marked lines. Caulk all seams and nail holes. Once caulk is dry, sand and wipe clean. Remove each door from the hinges. 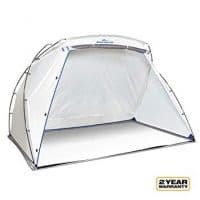 Place in spray shelter. We propped top of doors on a sawhorse and layed a tarp underneath. Use paint sprayer to paint the door. Do two even coats, making sure to get the edges of the plywood. Add any new knobs or hardware. Measurements will vary depending on your door sizes. We determined board lengths based on them being 4" away from the edge of each door. 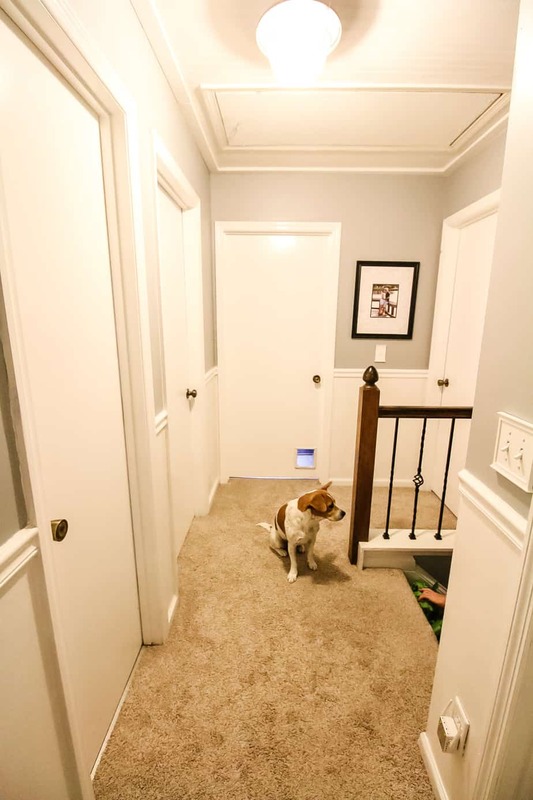 Almost every interior door in our home was a different width, so this was the best way to get a consistent look. This post was sponsored by HomeRight. 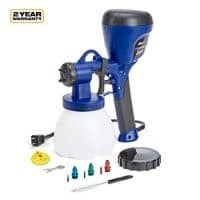 All opinions are our own and our opinion is that we love HomeRight products. Thank you for supporting the brands that make Charleston Crafted possible!